Shanhua Pagoda (Shanhuasi) is also called the South Temple (Nansi) because it lies in the southern section (Nan mian) of town Datong (Shanxi), just within the confines of the old city walls. It is a famous pagoda of the Liao and Jin dynasties. It was first constructed during the Tang dynasty (618-907AD) though most of the present wooden building dates back to the 12th century. The pagoda houses some intricately carved Jin dynasty (265-420AD) statues and has a screen wall decorated with dragons. Its overall layout is still well preserved today. 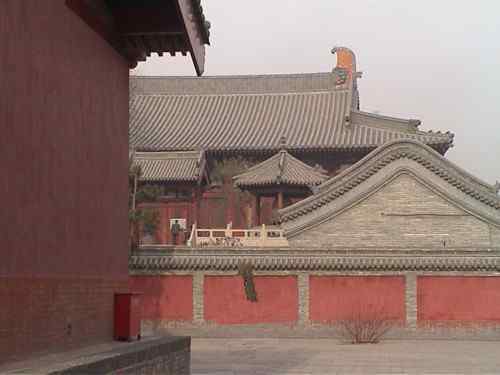 Arranged in order from south to north are the main gate, the Sanshengdian Hall and the big hall on the platform. The courtyard is encircled by corridors, the wing-halls on the east and west corridor in front of Daxiong Hall are all turrets.